Just like us, buildings have to continually evolve and adapt to modern life. Sometimes they have a tough time keeping up. When they are neglected for too long, buildings can become expensive, inefficient, ugly and unfit for purpose. And the thought of solving those problems is overwhelming. The University of Reading faced many issues with their existing library. Over the years the building had undergone many ad hoc interventions. It was filled with asbestos, the mechanical system was failing, the roof was leaking, the carpet was threadbare and the finishes were mismatched. Worst of all, the building was struggling to keep up with modern student needs because the layout was inefficient and study space was scarce. 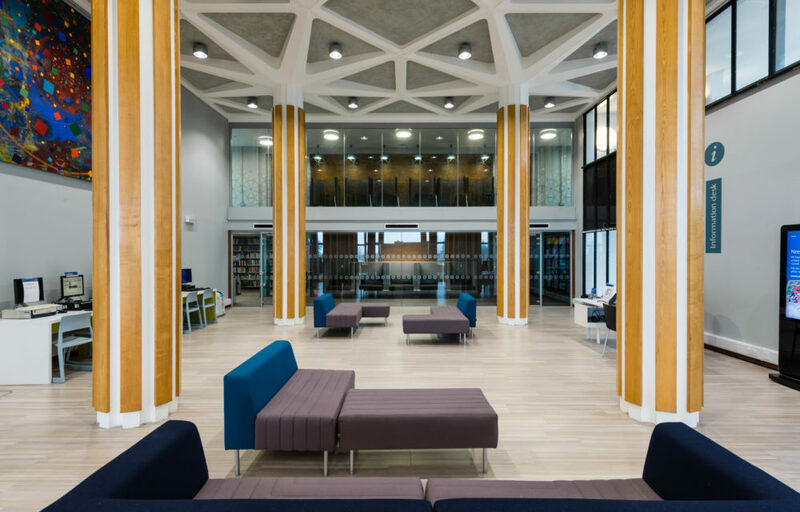 Despite all of the building’s problems, we worked with the University to prove that refurbishment was the best option. There are so many amazing benefits to keeping an existing building like Reading Library. There’s the obvious moral and ethical reasons for sustainability and minimising environmental impact. It’s also important to preserve history for future generations to enjoy. To build new with beautiful materials such as solid wood, brutalist concrete, aged brick and bespoke metalwork would be unattainable with a modern budget. However, the reason I find most compelling is a human one; retaining a sense of place. What does the building mean to people? The library has been the heart of the campus for over fifty years. It’s an institution. Staff know the ins and outs of every corner and have run a stellar service there for years. As worn as it was, the building helped people through their most stressful times and is held in great affection. So yes, it had its problems, but it just needed some TLC. We live in such a throwaway culture. When something doesn’t meet our needs or isn’t in style, we trade it in for a newer, shinier model. But I think we should view our existing buildings in the way we view classic cars and vintage clothes. They’re cool and distinctive. Let’s take care of them. With good design and a thorough approach, your efforts will be rewarded with something that money can’t buy – a unique building full of stories, history and life. We are exhibiting at AUDE Annual Conference 2019 | 15th – 17th April 2019 | Lancaster University. Drop by stand 4 and pick up a copy of our latest Inhabitant magazine. Issue 02 is all about the people who inhabit our university buildings. Stride Treglown > Creative reuse – is it worth the effort?